Dicentra spectabilis ‘Valentine’ features graceful, powdery grey-green foliage with a somewhat fern-y appearance. Striking cherry-red, heart-shaped flowers with protruding white inner petals borne on one side of and hanging in a row from long, arching, burgundy stems appear above the foliage in mid to late spring. Performs best in a rich, moist soil with partial shade, or at least protection from hot afternoon sun. 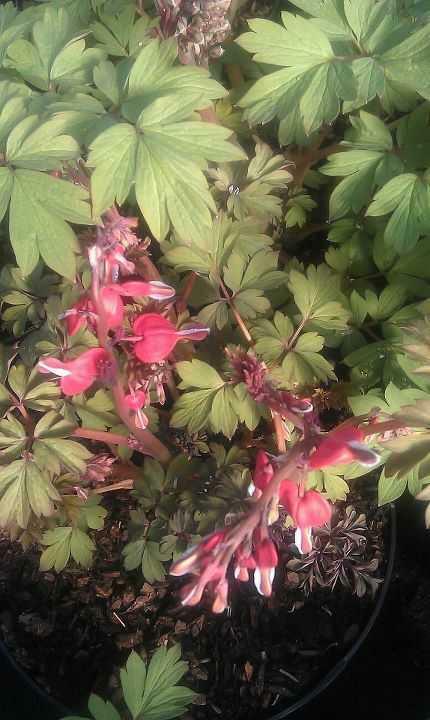 After flowering, Bleeding Heart should be cut back to rejuvenate the foliage. Even still, these often go completely dormant by midsummer, to return again the following spring.